It's Friday's Forgotten Books over at Patti Abbott's blog, Pattinase. And while Oscar Wilde doesn't qualify as forgotten, it never hurts to take another look at his celebrated wit and wisdom. Especially since 'wit' is so sorely lacking in the world these days. Don't forget to check in at Patti's and check out the many links to other Forgotten (or Overlooked) Books. There's always an eclectic mix. I've had this little book (published by the Peter Pauper Press) since I was a kid in high school. It's one of the few books which instantly sets me back in a different time. How it's survived the many years of being hauled around from pillar to post and places in-between remains a mystery. I have very few things from the Jurassic era of my youth, this book is one of them. It's an small anthology of Oscar Wilde's more famous (and some, not so) bits of wisdom culled from his conversation and from his plays. I don't have to tell you much about Wilde, I'm assuming you know he was one of the great Irish playwrights, poets and general bon vivants of the Victorian age. He was also a homosexual at a time when English law claimed this to be a crime punishable by imprisonment. Read more about Oscar Wilde here. Love that last one about being in the gutter and looking up at the stars. I remember reading it for the first time and thinking how true and how sublime. "I can resist everything but temptation" is also a favorite Wilde-ism. At one time it seemed to be my worldview! Perhaps you can apply your "forgotten" label to the publisher rather than the book or author. Peter Pauper Press was a private press publishing only slim but handsomely designed volumes of short fiction, essays, lyrics, light verse and even an illustrated alphabet. I have Japanese Fairy Tales collected and translated by Lafcadio Hearn, a very attractive little booklet. I think most of them were limited editons and some are rather collectable items. Having a Proustian moment here Yvette after your post, as it reminded me of a prized possession given to me by a considerate schoolteacher when I was a precocious 10-year-old, a small red book with gold leaf lettering on the cover, an anthology 'anecdotes and gleanings' that I thought was just the pinnacle of pith. 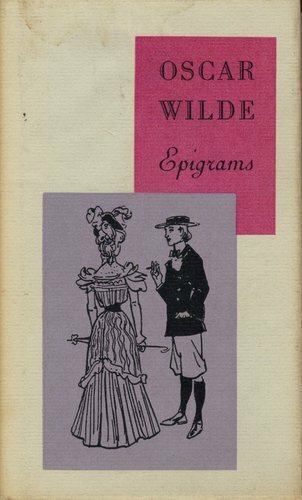 My favourite of the Wildean epigrams not quoted here is: "The English country gentleman galloping after a fox: the unspeakable in full pursuit of the uneatable"
Yeah, this is one of those little slim volumes. Funny how I've held on to it for all these years. I tried to balance some of his lesser known with his more well known. Oh yes, Sergio, I'd forgotten that one. It's one of his best and it happens to be so true. Though the riders on horseback in red jackets look mighty fine these days. Thanks for posting these Wildisms. Some I know, some I don't, but very glad to read them. What a genius Oscar Wilde was. Although many people know about him, it's not enough. Another favorite: The only thing worse than being talked about is not being talked about. Thanks, Kathy. I don't think Oscar Wilde will ever be forgotten. Not really. As long as his plays keep being produced to reach new audiences.